Maximum Line Size: 7/16", Safe Working Load: 1000 lbs. 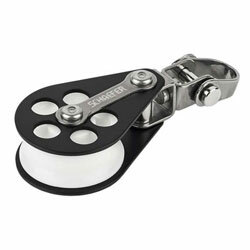 Schaefer 3 Series Blocks are perfect for small cruisers, daysailers and high performance racing dinghies. The quality metal construction can take the punishment associated with running rigging mounted on the deck or to spars.